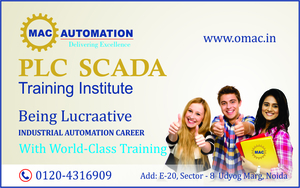 Best Omac Automation "PLC SCADA" Training Institute in Noida. We provide basic and advanced level PLC SCADA Training Institute in with proper practical knowledge and having 8-10 year experience faculty to introduce time to time industrial visit and free workshop environment , Job monitor by Live project. Call us at 9015516909 to get free demo classes and also for group discount.